One lucky day about ten years ago I stumbled across an estate sale where this record box set was calling my name. The deceased man whose trinkets were sold was a Shriner of average means. The artifacts he left behind spoke of a hard working man who toiled as a salesman for a good number of years. His family determined that instead of holding onto his belongings they’d rather get hard cash. I obliged them and walked out with a Super-8 loop projector and this box set. While he was alive our Willie Loman was a man of good taste. He entertained lavishly but within his means. 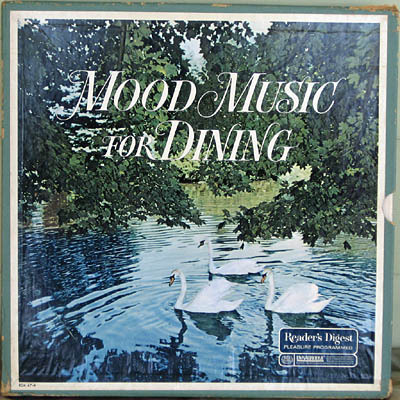 Mood Music for Dining was a cornerstone of many dinners and cocktail hours hosted by his wife. 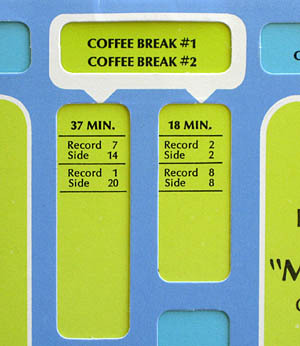 The record has a puzzling label on the front cover which says “Reader’s Digest: Pleasure Programmed.” What’s inside is nothing short of amazing. It’s a pre-digital iTunes made of paper, glue and vinyl. 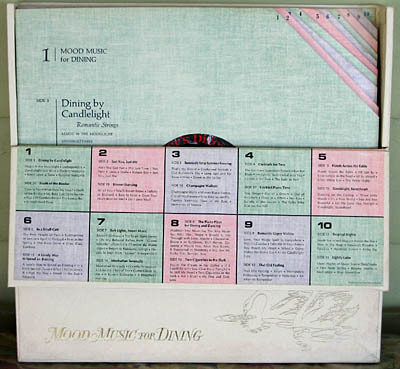 When you open the box a flap folds over uncovering 10 mood programs such as: Champagne Waltzes, Two Cigarettes in the Dark, Manhattan Serenade and others. But these are really just the names of the sides of the five records within. 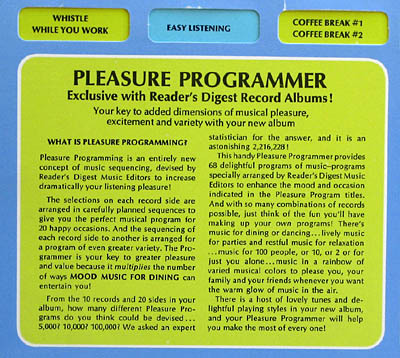 The real discovery inside is the Pleasure Programmer which allows the listener to select one of sixty eight pleasure programs. It works like an old logarithmic slide rule. You line up the name of desired program with the white marked opening and two playlists are displayed below the slit. The one on the left is the longer playlist and the one on the right is the shorter list. Since nothing is automated the playlists merely tell you the order of sides you need to play to achieve the mood which corresponds to your selection. Some of the moods have very illustrative names such as All Alone, Soup to Nuts, When the Boss Comes to Dinner and more. The music on these records is rather bland. All sixty eight Pleasure Programs amount to a perfect complement to blending a few potatoes and celery sticks in a food processor and eating it cold. This entry was posted in Records and tagged Bad record covers, mood music for dining, reader's digest. Bookmark the permalink.